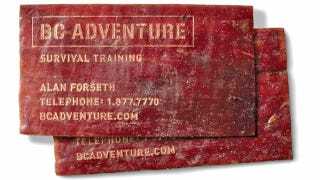 Though slowly becoming antiquated, the business card is still the easiest way to make a great first impression with a new contact. Your choice of design, fonts, even paper says a lot about you. So imagine the impression you'll leave when you hand someone your contact details laser-etched onto a piece of beef jerky—you'll soar up that corporate ladder.